Barrick invests in Idaho gold project. First Quantum nixes deal with Northern Dynasty. Maverix lands a royalty deal and partnership with Newmont. Here's a look at the top news in the gold mining sector for May 2018. This idea was discussed in more depth with members of my private investing community, The Gold Bull Portfolio. Here's a monthly recap of the top news in the gold mining sector, including acquisitions and takeover announcements, financial results and other relevant updates, to keep readers up-to-date on news in the sector. Here's my last update for April if you missed it. 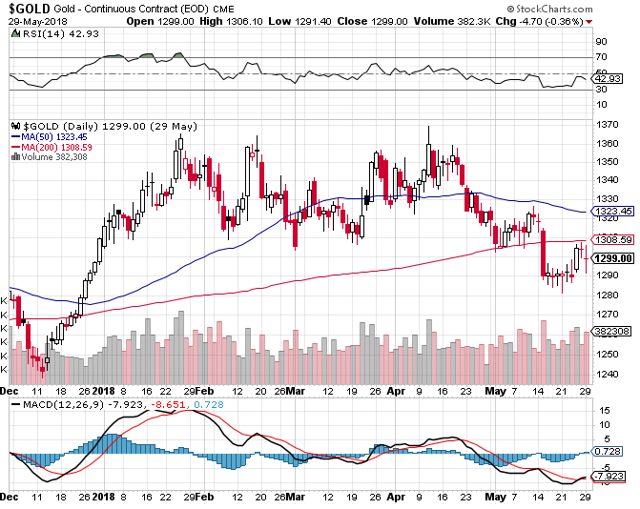 Gold prices recently took a breather falling from $1,350 in April to $1,290 last week, but have since rebounded to $1,303/oz. Prices look ready to surge again with a bullish MACD crossover recently occurring, and the 50-day moving average for gold remains above its 200-day moving average, a bullish technical sign. The third quarter of the year is historically the best time to buy gold. Also, as I pointed out recently, insider buying has been picking up a bit at various gold mining companies, another positive sign. I'd also like to point out that you can make money in this market even if gold prices trade sideways, as you can do quite well with developers and explorers. Bottom line: This could be a good time to buy gold stocks. 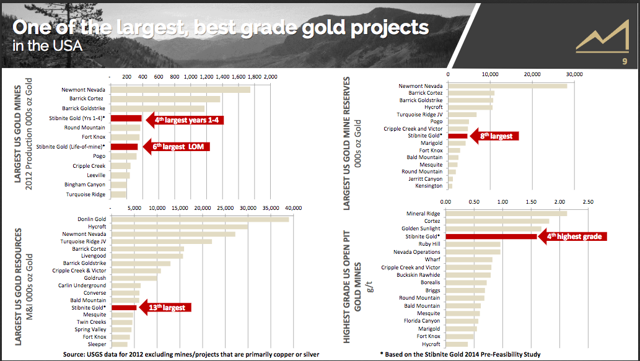 The month was highlighted by several investments made by mid-tier and senior gold producers in junior gold companies (which is great news for juniors!) as well as several big developments in the royalty and streaming sector. This article was released first to subscribers of "The Gold Bull Portfolio," my marketplace service offering. Subscribers get a look at my personal holdings which are made up of miners, juniors and exploration companies. The portfolio provides leverage to the price of gold, with the goal of outperforming benchmark indexes, such as the VanEck Gold Miners Index (NYSEARCA:GDX), the Junior Miners Index (NYSEARCA:GDXJ), and the price of gold (NYSEARCA:GLD). The portfolio has outperformed year-to-date, after gaining 41.50% in 2017 (compared to an 11% gain in the GDX). Barrick Gold (ABX) has made quite a significant investment in a junior miner called Midas Gold. The company announced that it will purchase 46,551,731 common shares of Midas in a private placement at a price of C$1.06 per share. Following close of the deal, Barrick will own 19.9% of Midas Gold. The company is supporting Midas' efforts to permit and advance its Stibnite Gold Project in Idaho. Proceeds will also be used to help advance Stibnite to completion of a feasibility study. According to its pre-feasibility study, Stibnite profiles as a long-life, low-cost gold mine, with average annual gold production of 337,000 ounces, although initial capital costs of $970 million are a bit high. Presumably, Barrick may be interested in a takeover at some point in the future, when the project is in a more advanced stage. We will see what the results of the feasibility study look like, which will include mineral resource drilling and metallurgical testing, and updated geological models to maximize returns. For now, the shares were bought for investment purposes. Barrick's forward guidance calls for a slight drop in gold production, so Stibnite could lessen the decline. It's an interesting development and I think investments in juniors from mid-tier and senior producers will only pick up from here as we've likely reached peak gold. First Quantum (OTCPK:FQVLF) has walked away from a framework agreementwith Northern Dynasty, under which the company could have earned into a 50% interest. The two companies were unable to reach a deal to advance the controversial gold project in Alaska. The project faces fierce opposition from locals; among the main concerns is contamination risk to the world's largest sockeye salmon fishery. It's unclear why First Quantum pulled out of the deal. Northern Dynasty was listed as a top gold stock to avoid this year in a previous article, when shares traded at $1.07. Shares of the company plunged by more than 30% following the news and now trade under $.50. The company is "confident" it can find a new partner for Pebble.